From charming culture and unrivaled modernity to astonishing sights and thrilling experiences, come discover the marvels of Singapore in four nights. Being an all-inclusive holiday complete with transfers and hotel stay, you’ll be able to relish every single moment of your well-deserved break without any stress or hassle. With a mix of City Tour, Singapore Flyer experience, and Gardens by the Bay Tour, you’ll visit some of Singapore’s most spectacular attractions in a single day. While city tour covers Marina Bay, Merlion Park, China Town, and Little India, Singapore Flyer promises you a thrilling sightseeing experience, with a ride in one of its 28 air-conditioned capsules. At the sprawling 100-hectare Gardens by the Bay, take in over 250,000 plants and flowers which comprise its three distinct gardens and two observatories. It's equally outstanding for its Supertree Grove with a collection of massive tree-like structures. 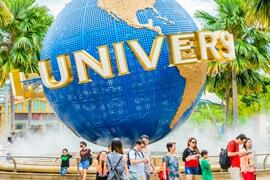 Besides a whole day at your leisure, you can also enjoy a day at one of Asia’s ultimate movie-themed parks, Universal Studios Singapore. Set within the popular Resorts World Sentosa, it has over 20 innovative rides and attractions based on some of the all-time-favorite movies or television shows; Sc-Fi City, Far Far Away, and Madagascar to name a few. Collected beautiful memories with this tour package! It was a wonderful experience. Visited Singapore with my best friends from college as a bachelorette holiday for one of them! The ride on the Singapore Flyer was my favourite while my friends loved the visit to Universal Studios. On the leisure day, we planned a small party for my friend right at the hotel we were staying and we had a great time. We came back home with some amazing memories. The four nights we spent in Singapore are etched in our minds as one of the best holidays ever. While the places we visited were great, what made the holiday really special were the arrangements made by Rayna Tours. The stay, hotel transportation and the execution of the tours, everything was done perfectly. We are planning our next holiday soon and we would definitely choose Rayna Tours for all the arrangements.